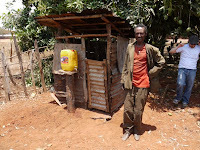 A community leader in Bereda Ethiopia, Gareka recognized a need to build latrines for his village. Hardly any home has access to safe and sanitized facilities and statistics show that 84% of the regions illnesses are communicable diseases - easily preventable through simple sanitary practices. Gareka and Food for the Hungry has worked hard to reduce his community's health risks by providing the facilities and training to local families. Food for the Hungry: Meet Gareka Abdisa.